The most wonderful time of the year is nearly upon us. We’re close to finding ourselves in Turkey Territory and the Jingle Bell Rock – the season of holiday lights, nostalgic Christmas movies, and swanky parties. Of course, not every party is as exciting as the rest, and some can be downright dreadful – like your office holiday party. Like it or not, if your company is hosting a holiday party this year, you’ll likely feel obligated to attend. An essential element of many classic holiday parties could turn out to be the most loathsome: alcohol. 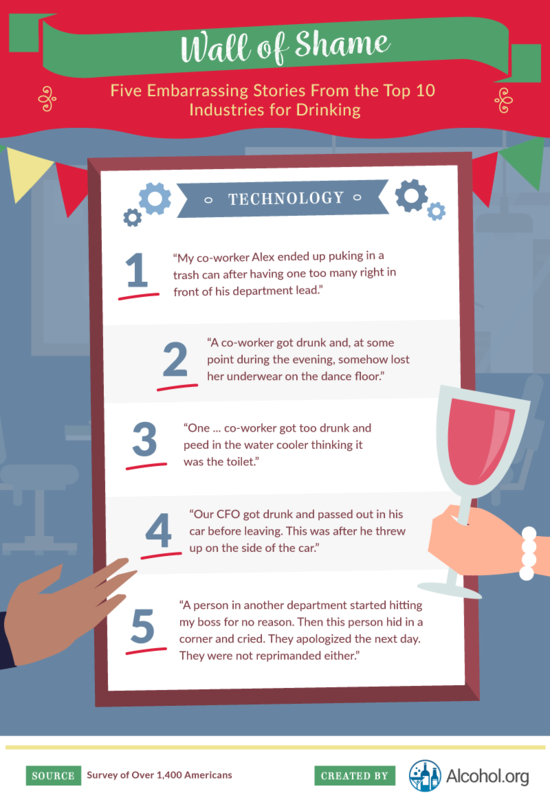 To learn more, we surveyed over 1,400 Americans to find out how much they typically drank at office holiday parties, if they planned to binge drink their way through the night, and the regrets that usually ensued. 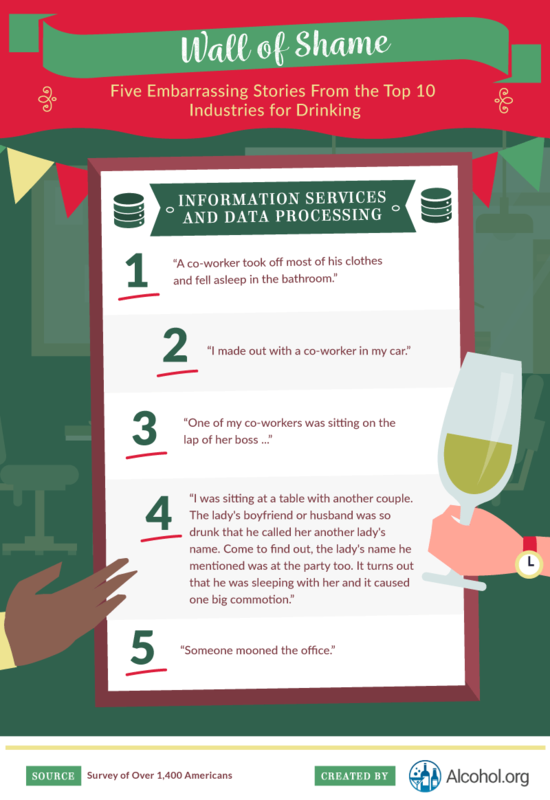 Curious about how often an innocent holiday party can turn into hooking up with a co-worker or getting sick in front of the boss? Read on to find out. 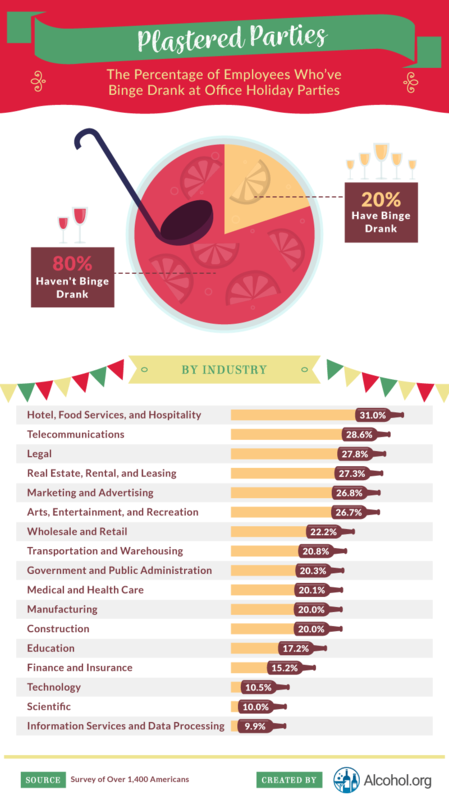 While nearly 65 percent of U.S. companies hold some holiday or end-of-the-year office party, more than half include alcohol at their event, and only 47 percent of those companies say they regulate the amount of booze their employees consume. If there’s ever been a good argument to put a cap on the alcohol employees can drink at an office holiday bash, it’s this: One-fifth of people have binge drank at an office holiday party. More common among people working in the hotel, food services, and hospitality (31 percent) and telecommunications industries (nearly 29 percent), binge drinking isn’t just when comrades (or even the boss) has too much to drink. It could also be when things start to get dangerous. Holiday parties with heavy drinking are more likely to experience sexual harassment among employees. And while it doesn’t take too much alcohol to impair people’s ability to drive safely, drunk driving is connected to binge drinking in 85 percent of cases. Just because you don’t drink all night at your party doesn’t mean you might not accidentally fall into the category of a binge drinker. The CDC maintains four or more drinks in one sitting for women and five or more drinks for men constitute as binge drinking. 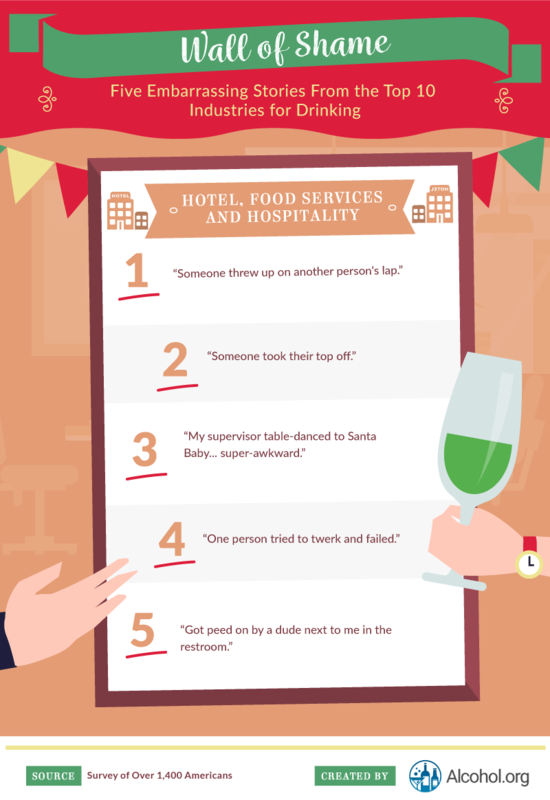 So how much are employees drinking, and what do they reach for first when alcohol is on the menu at their holiday office parties? According to our survey, only 12 percent of Americans avoided any alcohol at their holiday work functions. For the other 88 percent, the average drink count ranged from over two to nearly four glasses. When it comes to regulating the alcohol you consume in a single night, it’s important to recognize the alcohol content from one drink to another. Beer typically has the lowest alcohol by volume (ABV) rating, while a single shot of distilled spirits like rum, tequila, or vodka can have roughly eight times as much alcohol. And the parties where you might be more likely to find these kinds of over-the-top libations? According to our survey, roughly half of people working in real estate, retail, and marketing preferred mixed drinks to any other offering. With nearly 60 percent of companies serving alcohol at their holiday functions, and a vast majority of people drinking between two and four drinks on average, things can occasionally get a bit out of hand. According to our survey, certain industries were more prone to embarrassing alcohol-induced behavior than others. Over 79 percent of people working in marketing and real estate said they’d seen someone say something inappropriate at an office holiday party, while roughly 75 percent of people in telecommunications and retail saw their co-workers get too loose with embarrassing dance moves. For some industries, things could get more dangerous than embarrassing after drinking too much. 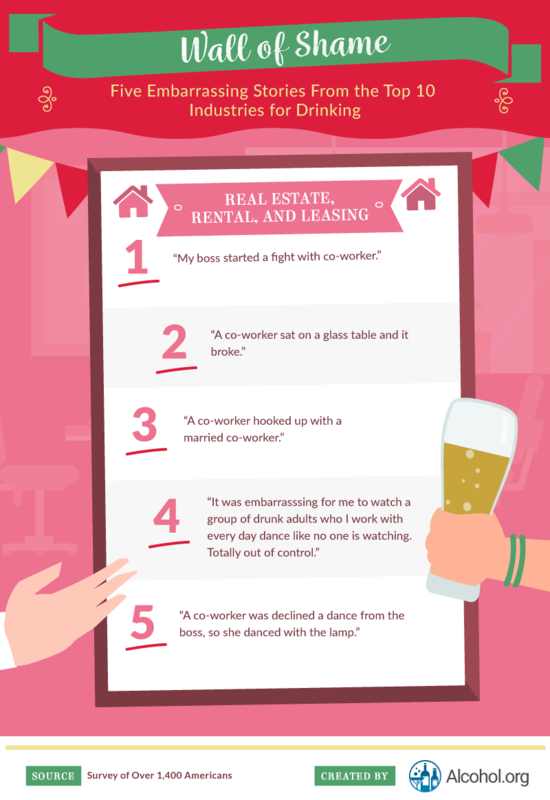 More than half of the people in real estate saw someone drive drunk, and over 1 in 10 people from the hotel and food services, marketing, and construction industries saw an underage co-worker drinking at an event. More than 14 percent of people in telecommunications and nearly 13 percent from arts and entertainment saw someone doing hard drugs at an office holiday party. If you’ve ever woken up after a night of drinking and felt guilty about the things you might have done under the influence, you’re not alone. Drinker’s guilt can be a real emotion, and it could leave you feeling worse than the physical symptoms you usually experience with a hangover. This anxiety might actually be a self-defense mechanism, acting as your body’s way of telling you that you had too much to drink or that the alcohol consumed was too strong. According to our survey, people were more likely to walk away from their office holiday parties with regrets if the alcohol they consumed classified as binge drinking. While 26 percent of women and 22 percent of men who binge drank at a company function regretted their behavior afterward, less than 1 in 10 men and women who monitored their drinking said the same. While post-party regret was highest among people working in real estate, telecommunications, and marketing, our survey found participants with mid- or upper-management positions were often more likely to regret their actions at an office holiday party than the rest of the staff. 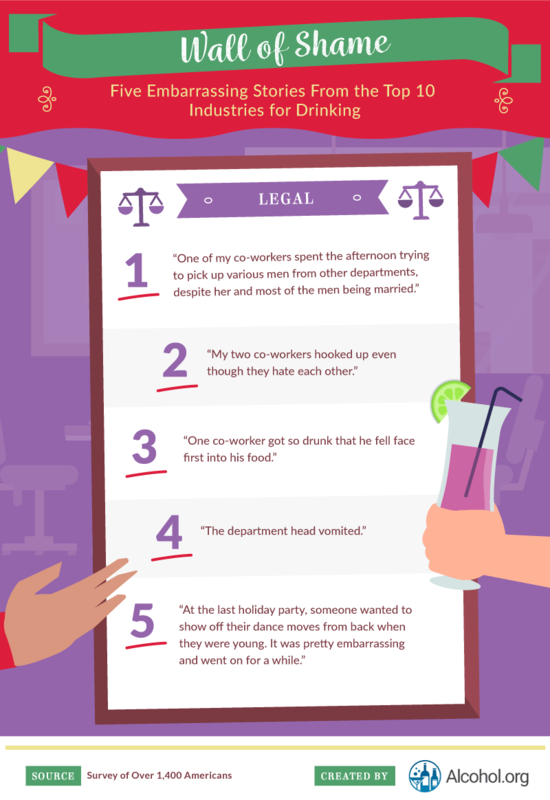 From getting visibly and violently ill to sleeping with a co-worker and regretting it later, there are a lot of reasons why most employees dread what could happen at their holiday office parties. 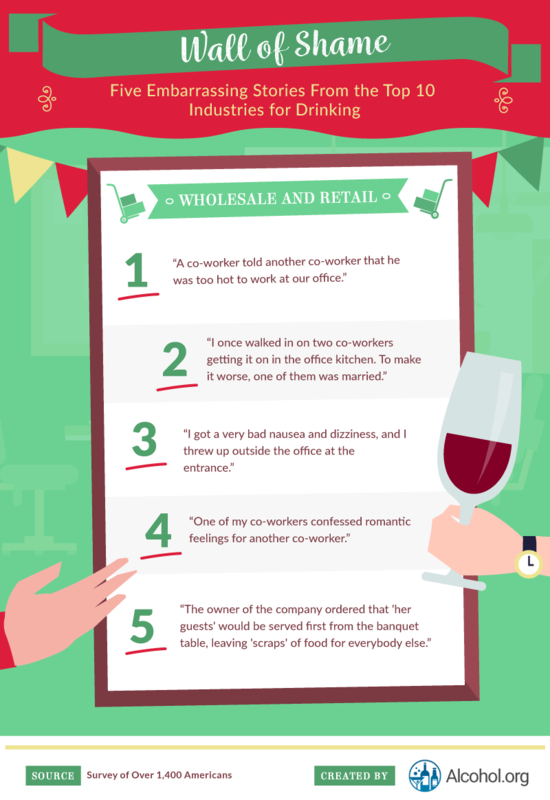 These are just a few of the stories respondents told us about in regard to overconsumption at an office holiday party. Do any of them sound familiar? 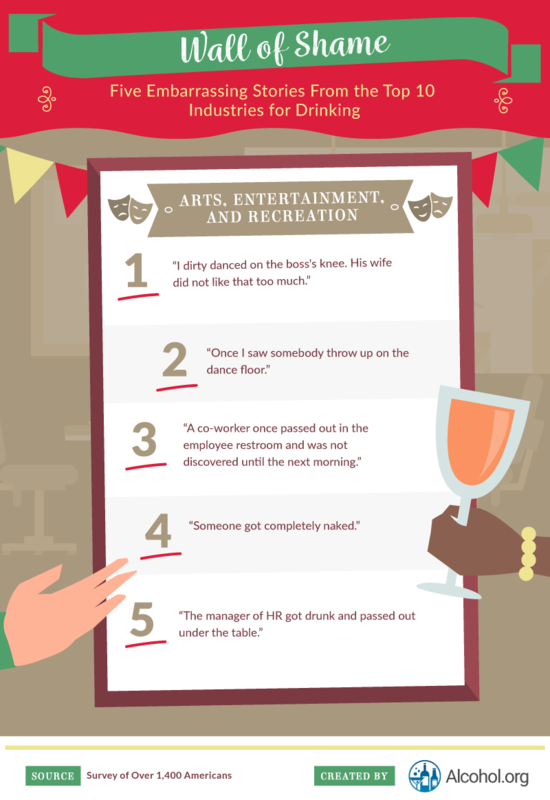 If so, you might have experienced (or at least witnessed) the real-life impact of a holiday party gone wrong. Click to enlarge any of the following graphics. From a holiday bash to celebrating the hard work you’ve put in over the year, office parties shouldn’t leave you feeling anxious or worried. There are a lot of things you can do to make your office holiday party this year feel less forced (hint: Try not to talk about work), and steps your company can take to make sure things don’t get too out of hand. Drink tickets or even hand stamps can be informal ways of monitoring the alcohol everyone consumes and making sure there are cabs on hand can help ensure everyone gets home safely. Even if you don’t start the night off planning to drink too much, accidents happen. Unfortunately, when alcohol is involved, these accidents can turn deadly. Every year, 75,000 Americans lose their lives as a result of alcohol misuse. If you or someone you love has an alcohol use disorder, Alcohol.org is here to help. From pointing out the signs of alcohol misuse to connecting you with resources, support groups, and help lines – our goal is to show the impact alcohol could be having on your life and how to overcome it. We surveyed over 1,400 Americans who have attended an office holiday party and asked them about behaviors they have witnessed as a result of drinking.